In order to provide powder activated carbon (PAC) mixing installations that facilitate a homogeneous and 100% dustless operation, Sodimate designed, and manufactured, in addition to our regular mixing tanks, its own PAC wetting cone. Sodimate Slurry eductor eliminates the use of slurry mixing tank, reduces the electrical consumption and floor footprint. The resulting slurry can be transfer horizontally and vertically with few pound of pressure at the process end injection point. 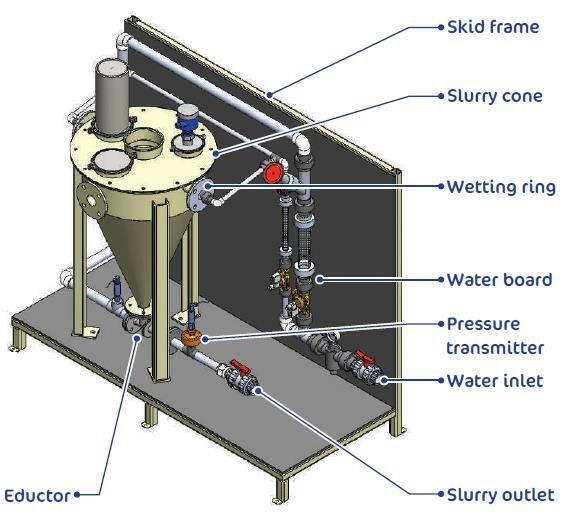 Sodimate slurry eductors use water or other liquids under pressure as the motive fluid, and operate on the venturi principle to mix dry chemicals into slurries. Water is constantly injected inside the slurry cone to provide instantaneous hydration, reduce dust, and avoid clumps and ‘fish-eyes’. The high-velocity jet of liquid from the eductor nozzle creates a vacuum, which causes the suction of the mixed liquid. 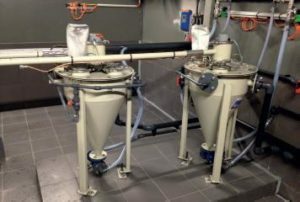 Eductors are an ideal way to continuously produce solutions or well blended slurries and are commonly used in chemical, food, power, pharmaceutical, and waste water applications. The slurry eductor can be supplied with all necessary flow, pressure, control and regulation instrumentation.